Please Please Please read this post about D'Angelo. I am so glad he is making a come back. Thanks to Naked & Natural for keeping her eyes peeled for the return of D'Angelo. There are no words! Before my now-husband and during the heartbreak of my first marriage, D'Angelo was the man I dreamed would carry me into the sunset and we would live happily-ever-after. His music is outstanding, very original and soulful. His look - unique. Masculine features. Well-defined body... (it's been said that he got fat but who cares, he's back?!! LOL). Welcome back D'Angelo. We missed you! woo hoo!!! everytime i hear "how does it feel" i'm instantly taken back to my 15 year old self walking down the hallway and being greeted by his beautiful body on the tv screen....lawdamercy!!! I have tried to convince every single on of my ex's that "Lady" should be "our" song. That song and D'angelo had me at hello! I'm so mad our subscription to GQ ended a month before he appears in it! Gotta get to a store soon. 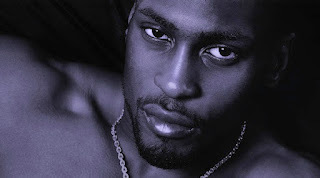 Go 'head D'angelo... with ya fine self! :-) excited!! !